These past 3 weeks, both my Instagram and FaceBook feeds have been flooded with stories chronicling the various relief efforts that people have initiated to raise funds or to provide goods and support to the Yolanda victims. I continue to be pleasantly amazed that there hasn’t been a shortage of generosity for our Visayan kababayans since Day 1. People just keep on giving and giving! 🙂 Even the international community has been extremely charitable and supportive of our country. The image of a US aircraft carrier navigating our seas, bringing with it soldiers, supplies, helicopters and planes, will forever be etched in my mind. If you, like me, are looking for more ways to personally contribute to this world-wide effort, please consider supporting Shop.Share.Care. It is a fund-raising online sale by the top Filipino accessories designers to benefit Typhoon Yolanda survivors. The brainchild of Ken Samudio (one of my favorite designers), other featured designers in the sale include Vida Lim, Ann Ong, Lally Dizon, Joyce Makitalo, Amina Aranaz, Miadore, Dennis Lustico, Anne Marie Saguil, Eric Manansala, Adante Leyesa, and many more! What powerhouses, right? And this is the perfect opportunity to own one of their pieces because the proceeds will go to a wonderful cause! Sale begins on Wednesday, November 27, at 6pm. 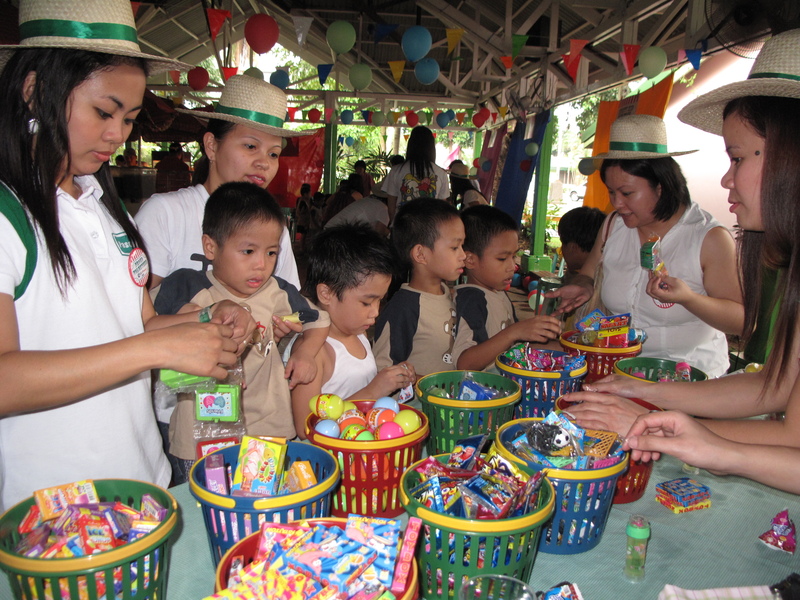 For more details, visit their website, http://www.shopsharecareph.com. One of the things I’ve repeatedly said that I love about my job is the opportunity it gives me to serve, and to do something good for others. 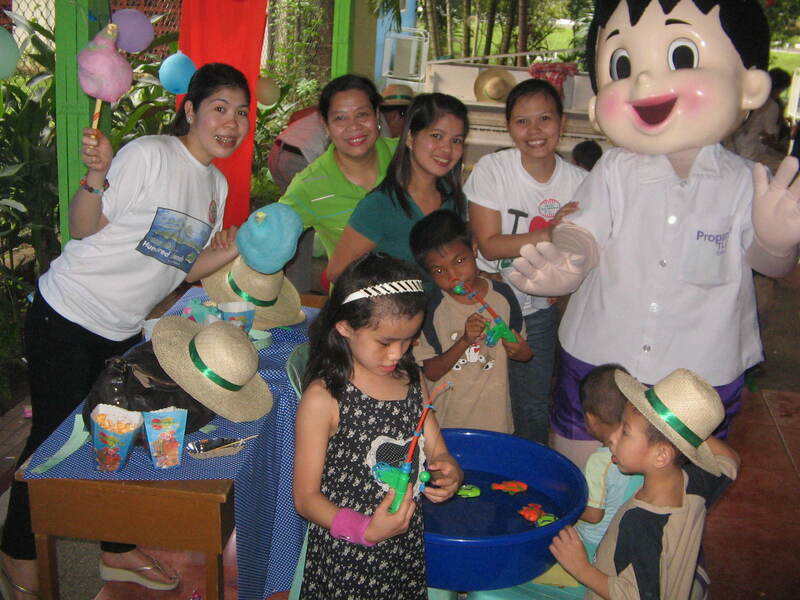 Aside from my role as Corporate Communications Director, I also head our CSR (Corporate Social Responsibility) Team. It is my job to determine our company’s areas of focus, and the programs we support. In the past 3 years, we’ve chosen to narrow our efforts to the fields of education, environment, and community health. Collectively, we call our programs the SEED Initiative which stands for, Sowing to Educate, Empower, and Develop. We’ve offered scholarship programs to children of our employees, we’ve partnered with organizations such as WWF to teach grade school children about climate change, and we’ve held numerous medical missions to help uplift the health situation of Habitat for Humanity communities. 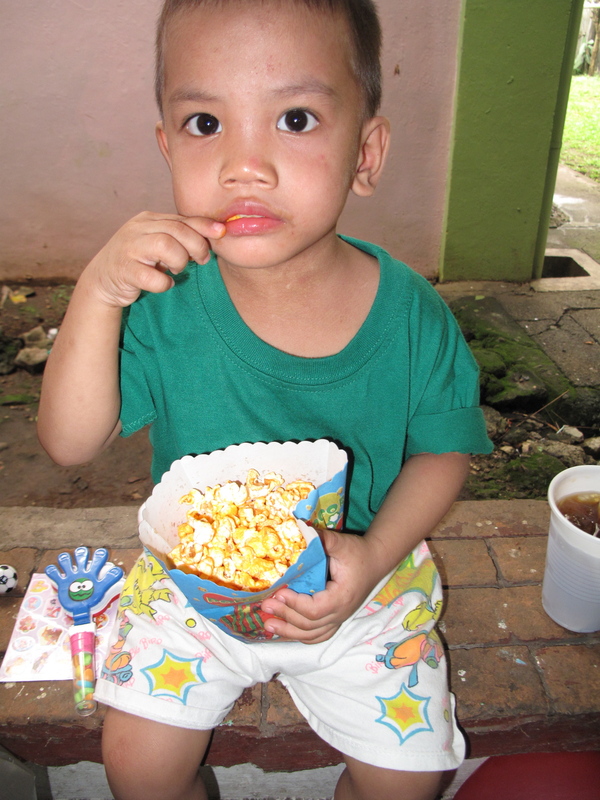 While I’m so proud of the work we’ve accomplished, I usually have mixed emotions when doing CSR work. Without a doubt, it is very fulfilling, but many times it also makes me feel sad that the problem of poverty in our country is so huge and overwhelming and unfair. In some cases, it even makes me feel hopeless and keeps me wondering if it is a situation that we will ever solve or eradicate. During the times I start to feel overwhelmed by hopelessness, I have to stop myself and try to focus on the positive things we are able to accomplish as a company, and to remember the people who we have been able to help and who have benefitted from our efforts. As the saying goes, “Rome wasn’t built in a day”. Applying it to this situation, it will take a mighty, collective effort, as well as a considerable amount of time, to instigate big changes in our country’s poverty situation. What’s important is for people to continuously pitch in and do their share. And hopefully, throughout the years, these little collective efforts will get bigger and bigger, and effect a big change. The same can be said for the recent efforts that have gone into helping the victims of Supertyphoon Yolanda. The destruction has been utterly massive, and I can imagine how, seeing the images on TV, one can feel so devastated and wonder if our people in the Visayas will ever be able to rebuild their lives again. But the outpouring of generosity from various people, companies, church groups, NGO’s and industries have been so inspiring, it somehow restores my faith and makes me believe that we will definitely rise up from this tragedy, and that we WILL overcome this dire situation together. In fact, it is because of the pro-activeness and tireless giving of these groups and individuals that our medicines have been able to reach the far-flung towns that were badly hit by the supertyphoon. Receiving her text instantly made me feel thankful that Metro Manila was spared from the brunt of the storm, and at the same time privileged to be able to donate medicines and other goods that would be more than helpful to the survivors in her town. Aside from Ormoc, Guiuan in Eastern Samar was another badly hit area. Luckily, because of the generosity of the people behind Alphaland and Balesin Island, we were able to respond quickly to their need, and to fly some medicines to the wounded people there. It was quite an experience to walk into their private hangar, and to see the massive amounts of goods, waiting to be flown and distributed to the survivors. Again I felt extremely lucky to be on the giving end, knowing that our small contribution would make a big difference in the health and well-being of the people in Guiuan. It is my sincerest hope that the kindness, compassion and generosity that I have witnessed and have been privileged to be a part of these past few weeks does not wane. The road to rehabilitation will be long and difficult for the Visayas, but as long as the outpouring of support from our fellow Filipinos remains constant, as long as people continue to pitch in whatever little they can, I am sure we will prove to the world that together, we can indeed surpass this tragedy, and rise from it. Being able to bring the gift of health to underprivileged communities is such a blessing :). 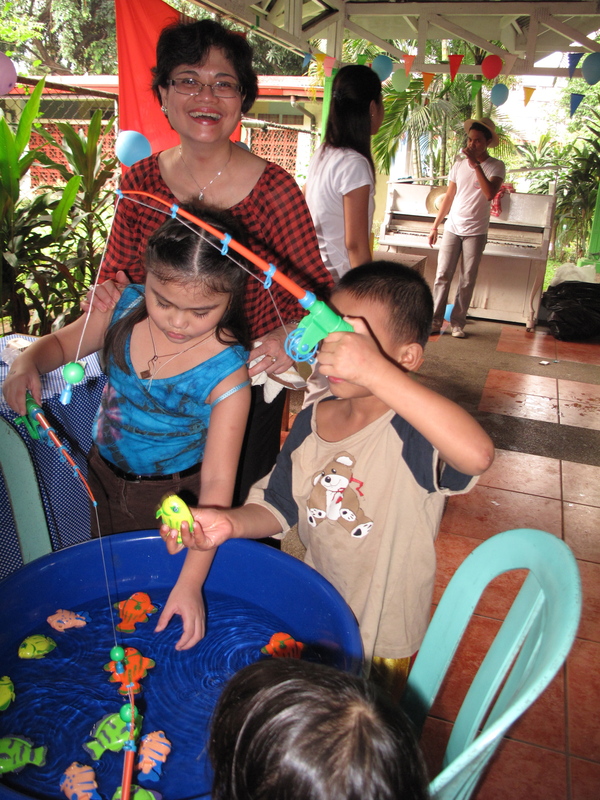 Last week, volunteers from our company conducted a medical mission at the KarismaVille Subdivision in Malabon. 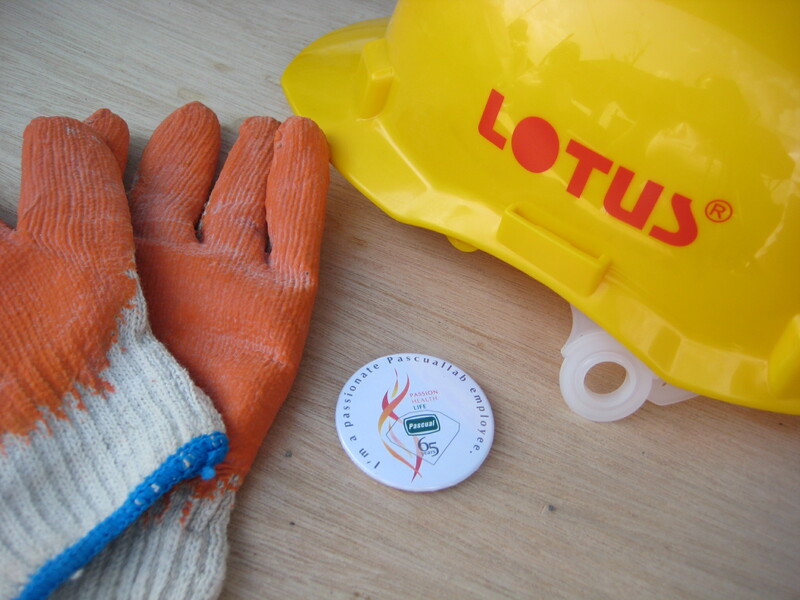 It’s a project we have in partnership with Habitat for Humanity Philippines. It was such a wonderful way to spend my day :). My IG post that morning: It’s a wonderful day for a med mission! Let’s get these people healthy!!! You can’t imagine how many people–kids especially–are sick nowadays. Unfortunately, most people in the community can’t afford to buy medicines to help them get better :(. Days like these are both fulfilling yet humbling. It makes more obvious how my world is very different from theirs, and how I’ve been very fortunate in my life. It kinda puts things in perspective, doesn’t it? Definitely, it makes me think twice before I start ranting about my problems :). I am truly thankful for the generosity of our employees who helped make the med mission a success! Their willingness to serve and to lend themselves to this cause is so inspiring! My girls and I have been working so hard lately, that I totally feel we deserve a break–a break from the stress and madness! Hahaha! As timing would have it, we were recently invited to WWF’s (World Wildlife Fund for Nature) Partner’s Night at Chef Jessie’s in Rockwell. This event is held yearly, and is an opportunity for WWF to award the different companies that they work with, and that support their environmental advocacies. We were not only honored to be one of the evening’s awardees, but we were also very excited at the chance to kick up our heels, get dressed in fancy clothes, and just be away from the confines of our office. Hahaha! Never mind that it was a work-related function–we were all just so thrilled to be able to have a night out! Hahaha! We arrived at Chef Jessie’s just in time to find our seats, have a quick bite, and make the rounds of greeting our friends at WWF. Soon after, we heard the name of our company called, so I had to go up the stage and accept the award. The best part of the evening (aside from receiving the award, ofcourse!) was being able to meet Rovilson Fernandez and Marc Nelson, WWF’s brand ambassadors, and the hosts of that evening’s shindig. Here is my team posing with Rovilson and Marc, as well as with WWF’s Chairman, Vince Perez, and President, Lory Tan. Haaaaay! To be in the presence of such cuteness! Hahaha! Seriously, though, I am very proud of the work my company has done with WWF. This year, we collaborated on a project called Kalakasan, Kalikasan, an environmental life skills program aimed at educating children aged 9-11 about the effects of climate change on health. It taught them about the causes of global warming, and how we play a huge part in saving the environment even through small lifestyle changes. Students were also taught how to keep themselves healthy in the midst of the ever-changing weather patterns, and the increasing incidence of weather-related diseases. The nice thing about the program is its trickle down effect. It began with the teachers, was passed on to the students, who in turn shared the information they learned with their families. It was a very successful collaboration so we will definitely be doing it again with WWF next year! Hooray! And it will be even bigger and better, with more schools enrolled in the program :)! It’s initiatives like these that really make me proud of the work that my team does. To be able to affect lives positively and to be a proponent for change is not just fulfilling, but it is also such an honor. Especially lately that we can really see how “damaged” Mother Nature has become, and how we are feeling the effects of global warming, it makes every contribution to saving the environment all the more valuable. And I’m glad that through this effort, our company is able to do its share :). Okay, enough of the seriousness…Let me end this post with my final photo of that evening–a souvenir of the cuteness that is Marc Nelson. Bwahahaha! Yes, ladies, that is my arm around his waist 🙂 Hahaha! Yes, I have no shame. Hahaha! It was definitely a fabulous night :). 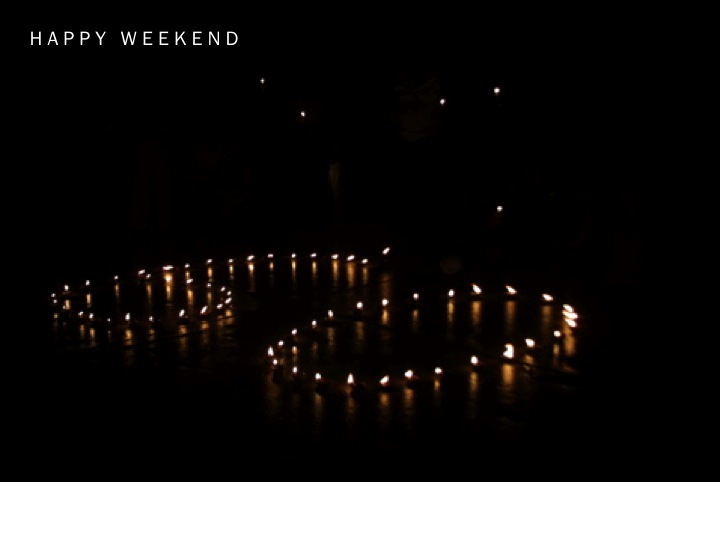 Earth Hour + Happy Weekend! Today, the entire world comes together once again to celebrate Earth Hour. 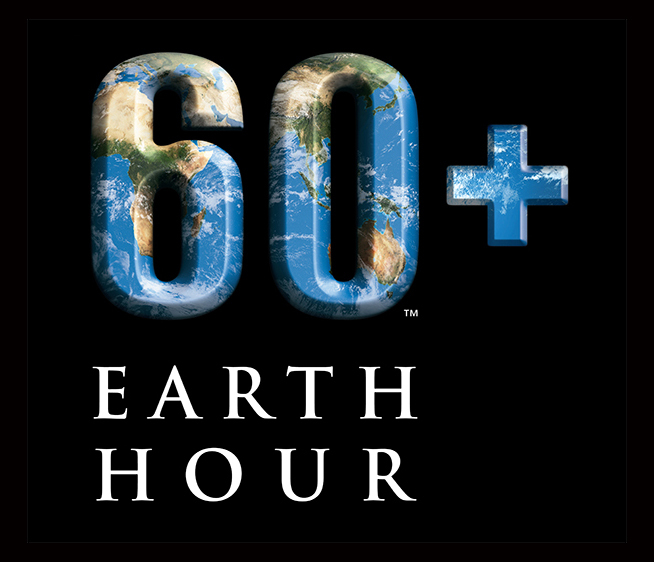 Earth Hour is a global initiative spearheaded by WWF (World Wildlife Fund for Nature) to raise awareness on the need to take action for climate change. It is the first time that a worldwide effort unites people, businesses and governments to take a stand for a common cause–the environment. 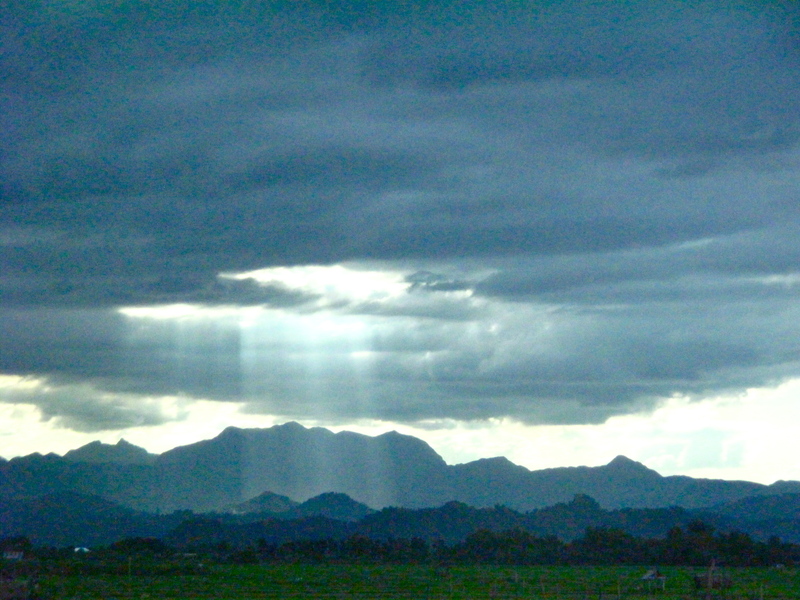 More than 5200 cities and towns in 135 countries globally switched their lights off last year, during Earth Hour 2011. This year, the Philippines is aiming for another world record, and to achieve Hero Country status. 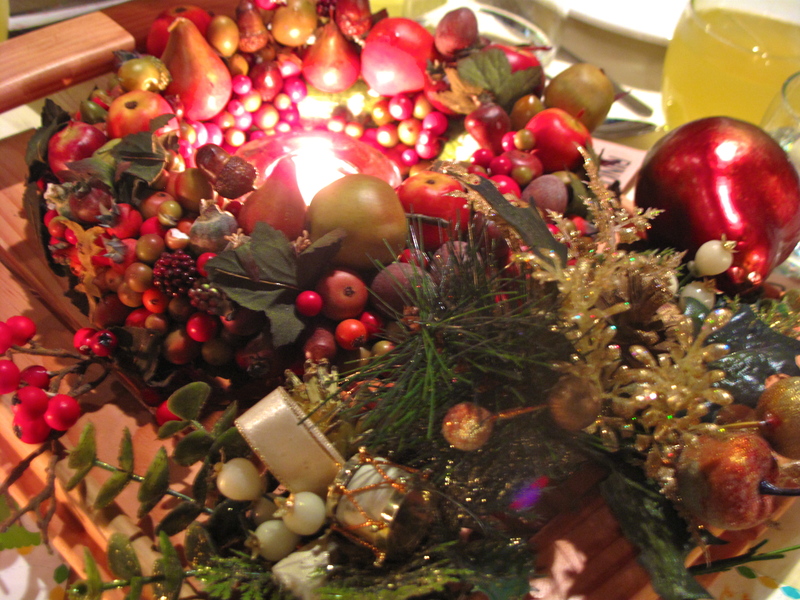 I don’t know about you, but the days leading up to Christmas were crazy hectic for me! With work and social commitments piling up, and a never-ending amount of gifts to shop for and wrap–it was all getting a bit much (which also explains my extremely long hiatus from my blog)! I was starting to feel really overwhelmed, and honestly, I was also feeling a bit ashamed that I was forgetting what the real reason for the season is. I am very fortunate, though, that the powers that be have a way of bringing me back to reality, bringing back my sanity, and enabling me to escape the hustle and bustle of the holidays. 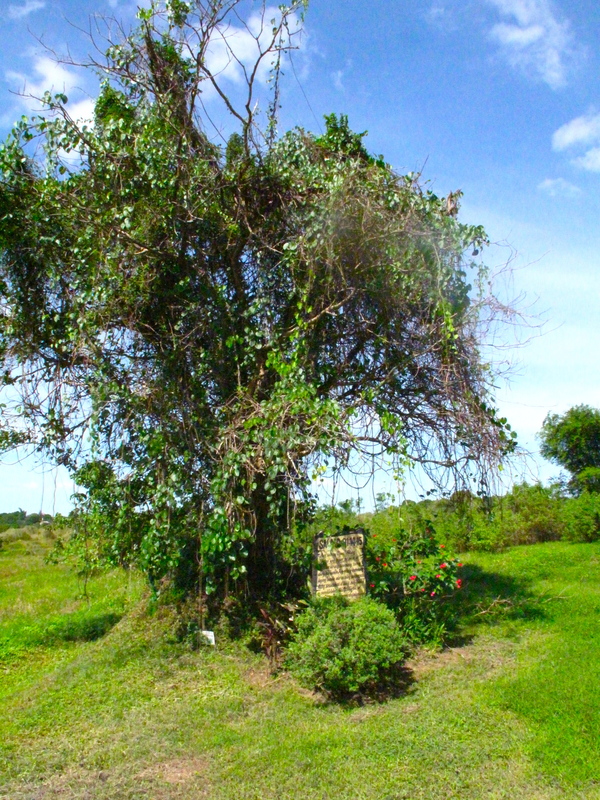 My Lola L, in her lifetime, purchased some land in Sta. 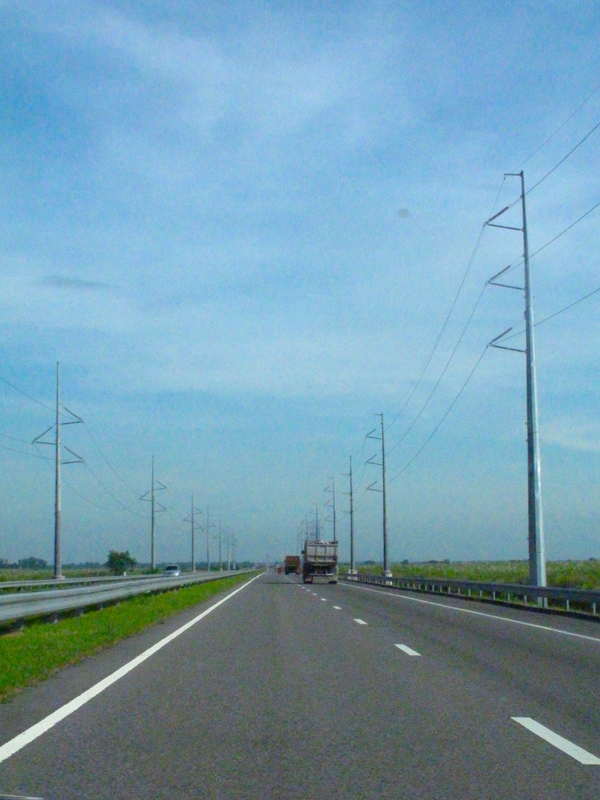 Rosa, Nueva Ecija. Before, the farmers who tilled this land used to call it Lupang Sinumpa because the soil was very arid, and could not bear any fruit. Today, however, to say that the land is productive is a complete understatement. 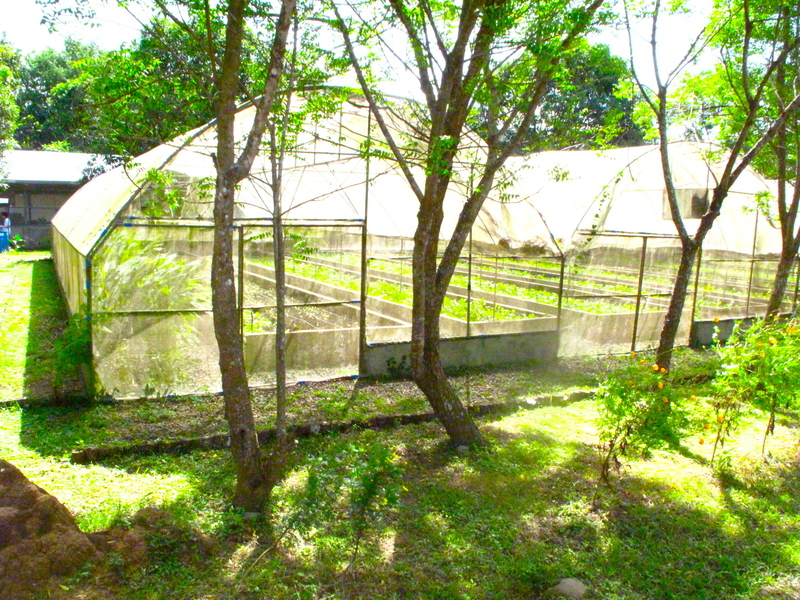 Not only does our company grow most of the herbal plants that go into our products here, but this farm is also the first and largest organically certified farm in the Philippines! Galing, right? It is something I’m very proud of–and the farmers are as well. Not only do they now have a regular source of income, but they are living proof of how a useless piece of land can become a blessing through hardwork and perseverance. Their story is truly a wonderful and inspiring one to tell. I can’t tell you how much I love coming down to our farm! I was so excited that the opportunity presented itself just at the right time when I was getting very stressed with work and life in general :(. I was there with my family to celebrate Christmas with the farmers, as well as to see the recent developments and new areas in the farm. 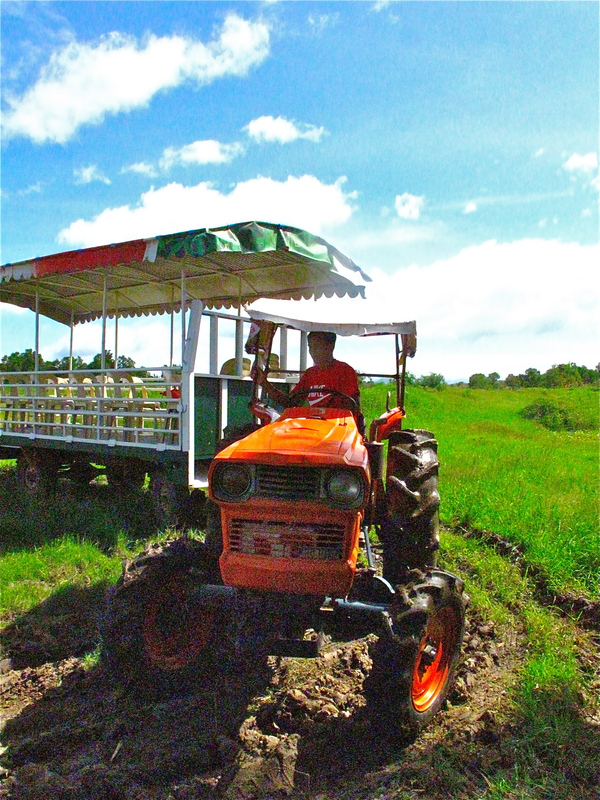 What I appreciate the most about LAC (which stands for Leonie Agri Corporation), is that the pace is slow, and time seems to be at a standstill. 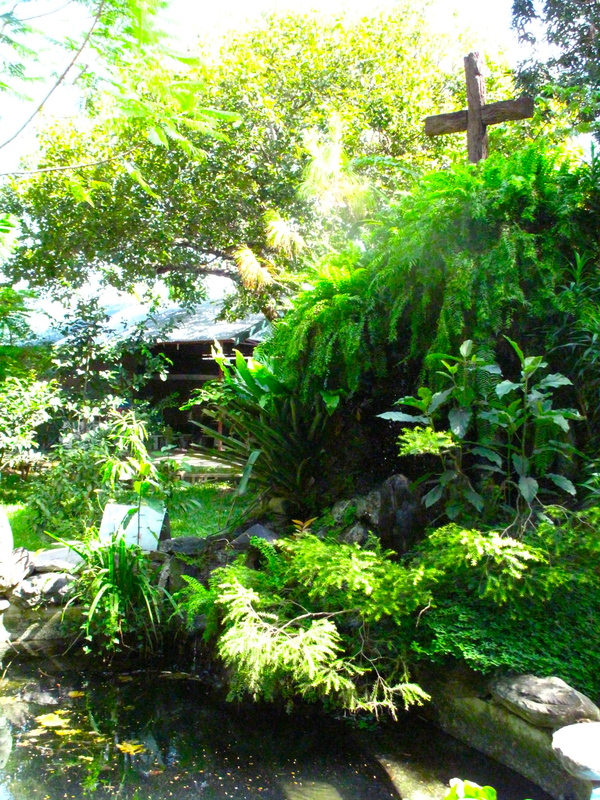 The air is fresh, and there is A LOT of greenery around. 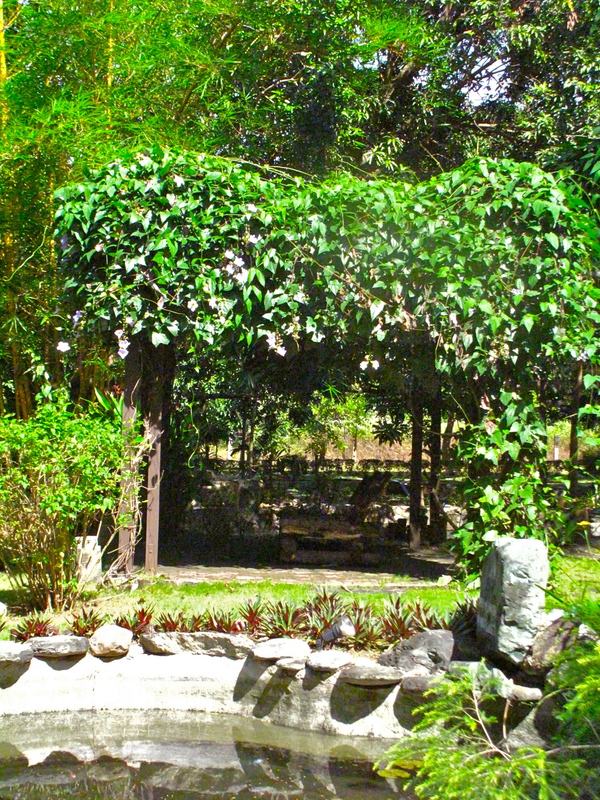 It’s difficult to not feel relaxed in such lush surroundings :). This was definitely what the doctor ordered :). 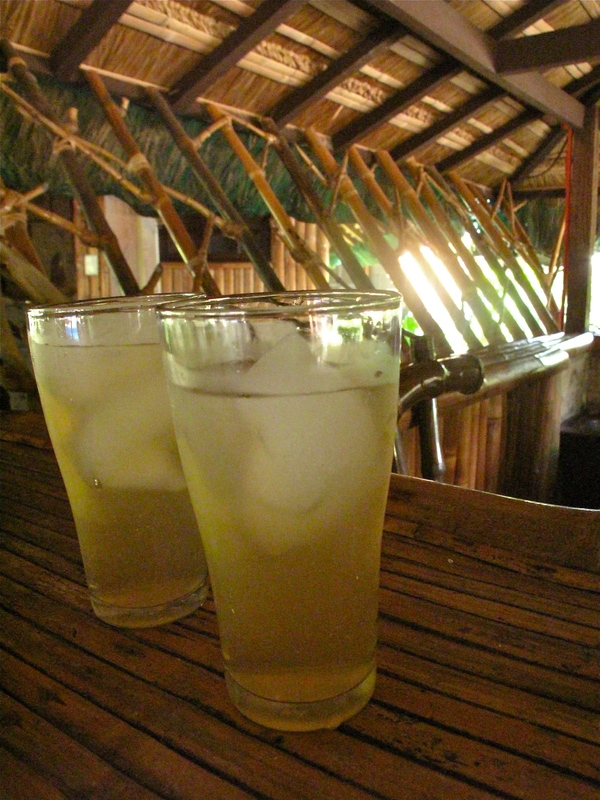 When my family arrived, we were immediately treated to a refreshing round of Tanglad Iced Tea (Lemongrass). I always look forward to this welcome drink because it always does the trick of quenching my thirst, and for some odd reason, it also makes me feel really comforted–kinda like wearing an old, familiar t-shirt. Weird, huh? But anyway, nobody knows the recipe of the iced tea except the LAC staff. It’s a well-guarded secret :). After freshening up a bit, the farm general manager, Farmer A, took us on a short tour. 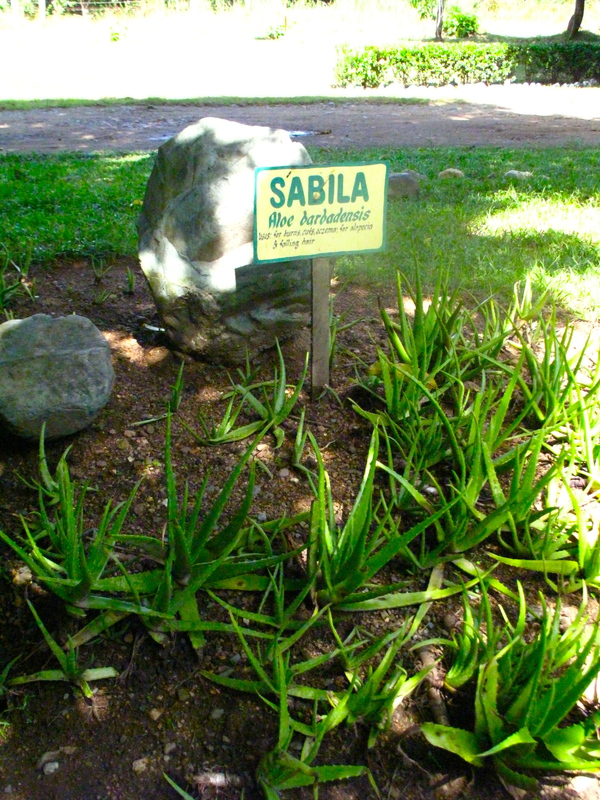 We started out in the main area, where they planted an herbal and medicinal garden named after my grandparents. I noticed they also did some landscaping and made a fountain area and gazebo. 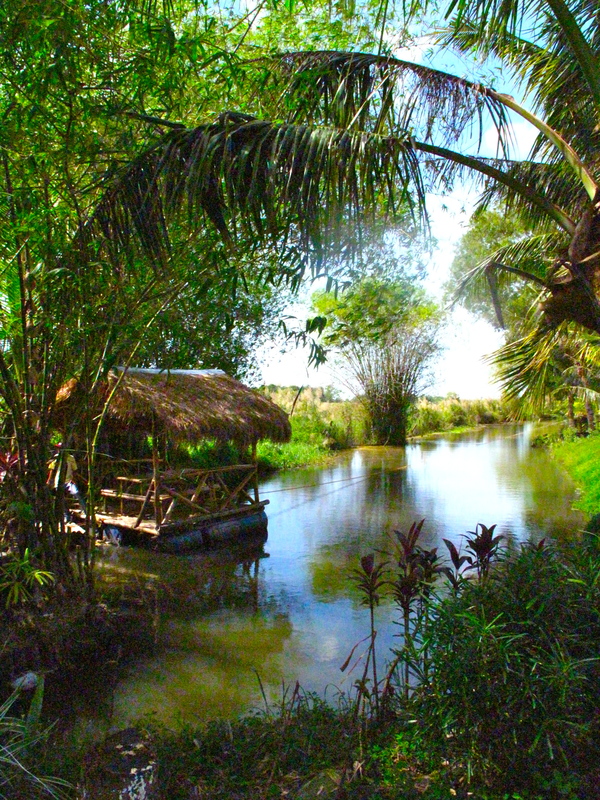 After this area, we boarded a kuliglig (or at least I think that’s what it’s called), which is a make-shift transportation hauled by a tractor, and went on to tour the rest of the farm. 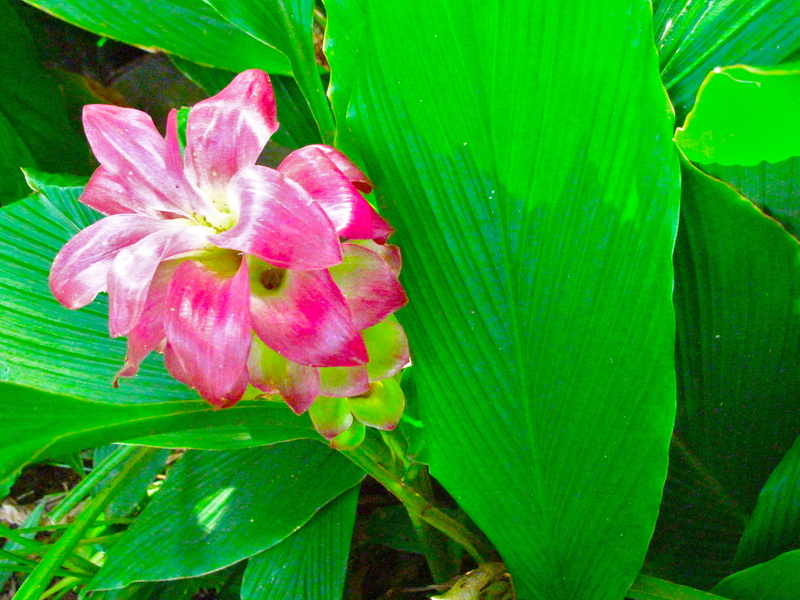 I love the vibrant color of this flower. So happy! 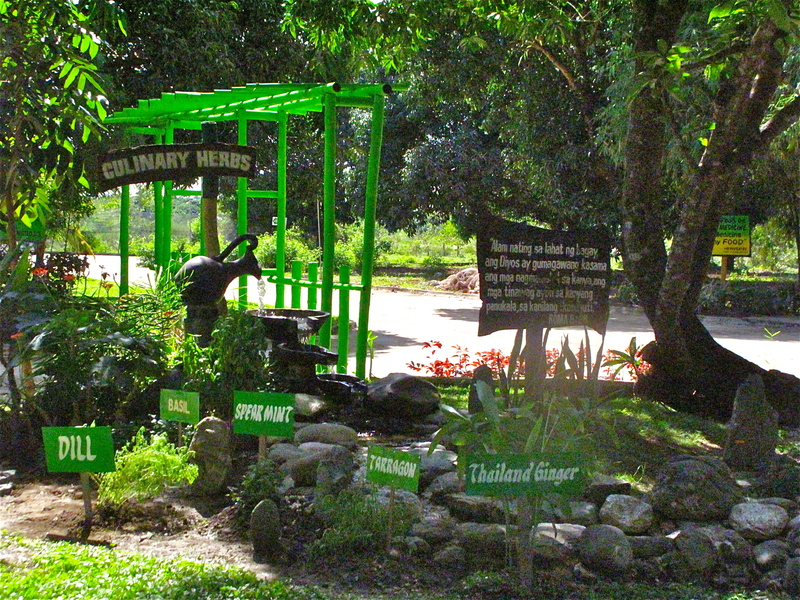 Aside from herbal plants, we also grow organic vegetables and sell them exclusively at SM. This is the area where we grow our lettuce. Most of the areas in the farm are named after Biblical passages. There is great spirituality amongst the people who work here. Yet another reason why I love this place. Doesn't this tree look like it came straight out of a horror movie? True enough, the older farmers would recount stories of seeing a white lady by this tree. Spooky! 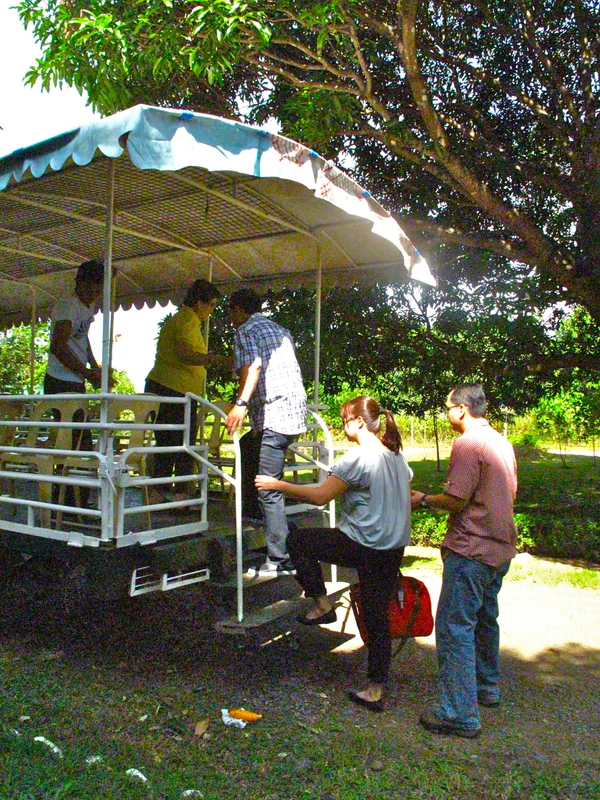 A front view of our "ride". 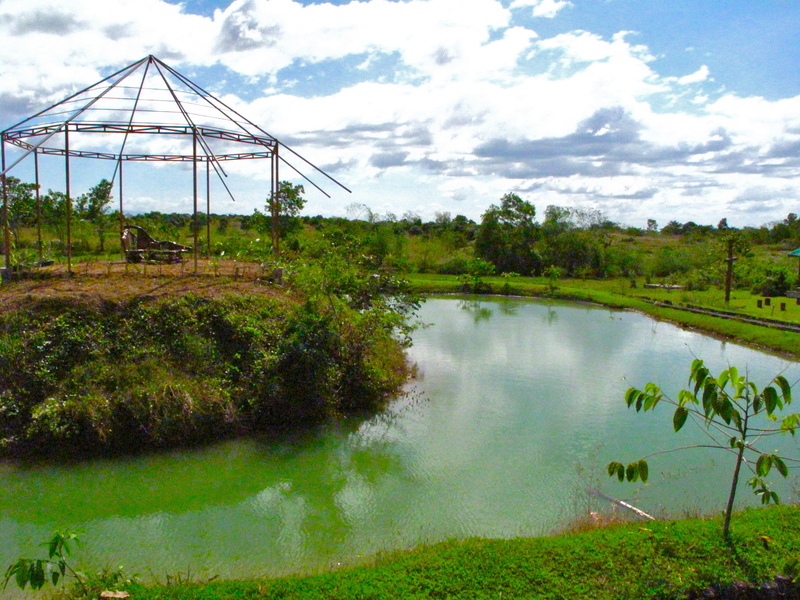 This is one of the main attractions of the farm. It's called Salmo Uno (Psalm One). It used to be thick with talahib (tall grass) until one day, as the farmers were digging, they found a well spring and the ground started filling with water! They were so amazed at the abundance of water that was gushing from the spring because for so long, the land was extremely cracked and arid. 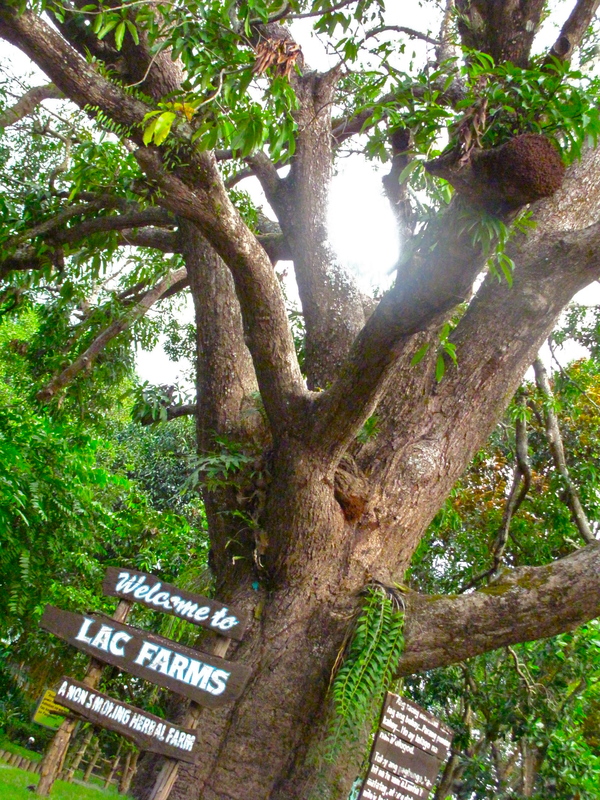 Because of LAC's success, many have tried to replicate its business model. 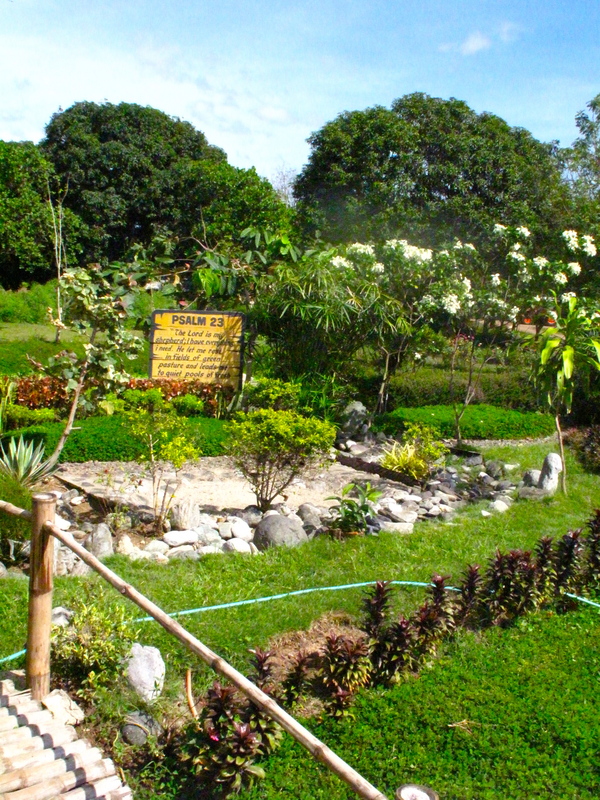 The farmers and management have so generously made it a point to "give back" and train other farmers in the area so that they can learn organic farming. 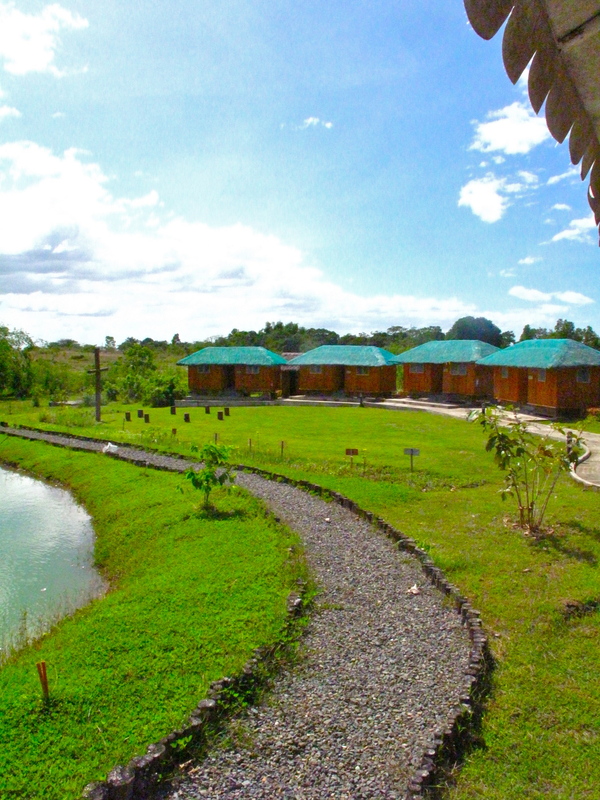 These are the kubos where they house the trainees. Signs of progress and development everywhere! 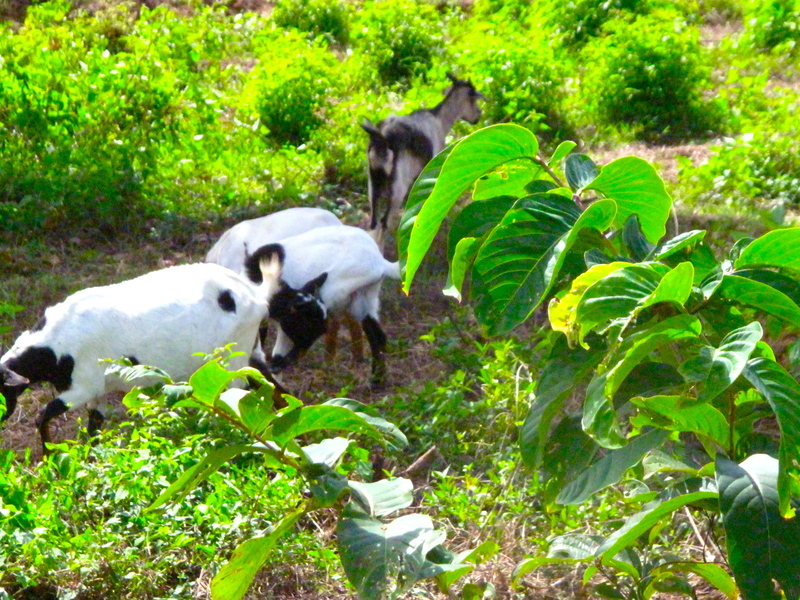 We also raise organic animals in the farm--goats, pigs and wild boars 🙂 According to Farmer A, organically raised animals are clean, quiet, and tame. We ended our tour back at the main area, just in time for a sumptuous lunch of fresh salad, pakbet, fresh steamed lapu-lapu and organic lechon. 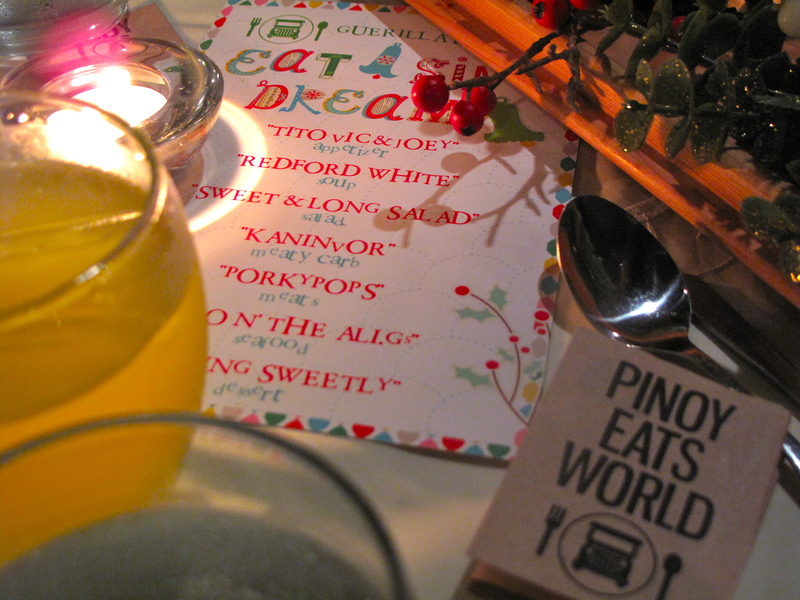 It was very simple, but verrrrrry yummy fare :). Lunch was followed by a short program by the employees, where they danced, sang and entertained to everyone’s delight. Seeing the smiles on everyone’s faces really made me think about my so-called “stressful” life, and suddenly, it did not seem so stressful anymore. When I saw how these people, despite their poverty, were so happy enjoying simple pleasures, it made me feel really ashamed of how I sometimes tend to take what I have for granted. It also made me think about simplifying my life and going back to the basics–God, family and health. Boy, do I have a lot of contemplating to do for the coming year! God, truly, has a sense of humor :). I am very lucky to be part of an organization that sees “giving back” not only as a major thrust, but an integral part of company life as well. I don’t mean to say this to pat myself on the back or para magtaas ng sarili kong bangko, but I am just very proud and amazed how much the spirit of giving thrives strong among our employees, and I am humbled by how, despite the difficulty of the times, they still make it a point to share their blessings. My company has been a long-time partner of Habitat for Humanity. 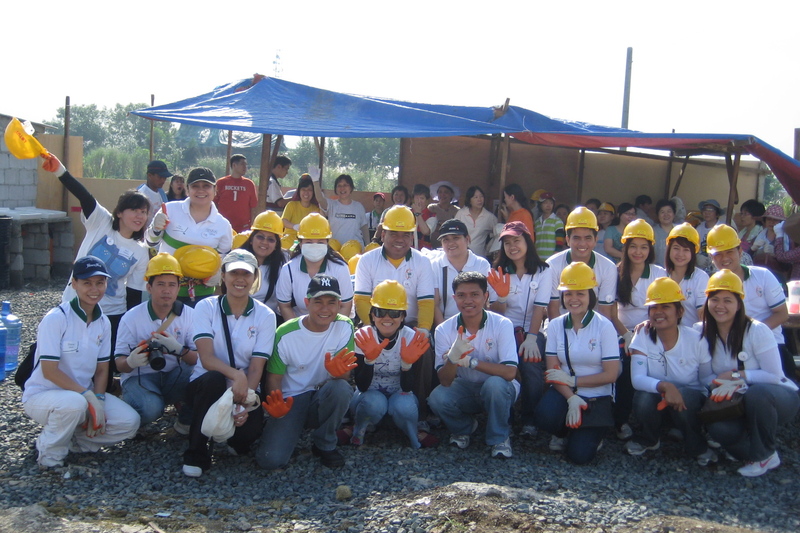 To culminate our 65th year anniversary, we held a house build at their Navotas site. 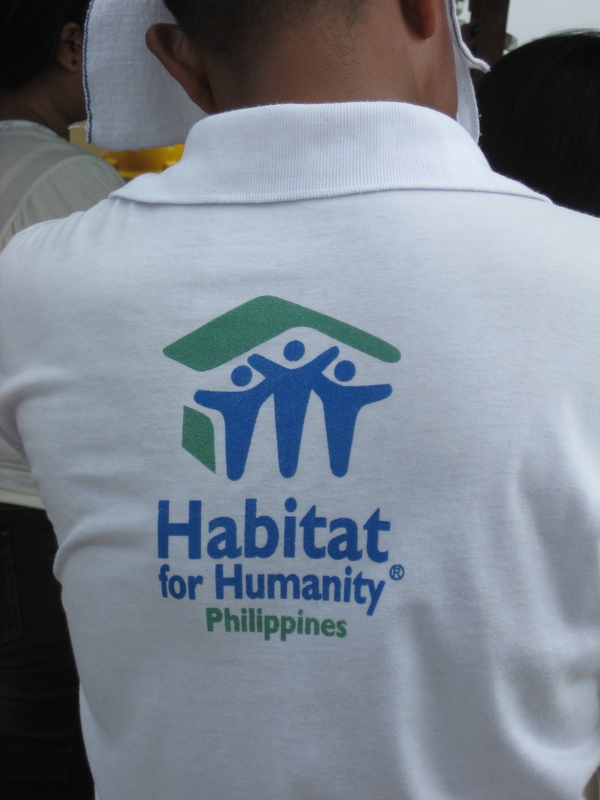 Habitat is attempting to put up 500 houses for the families from Manila Bay, who were displaced by Typhoon Pedring.